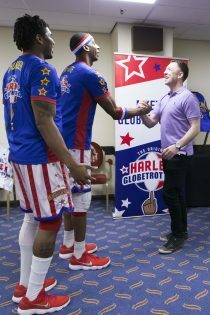 BIG SURPRISE: Jason Kennedy, Head Coach and Chairman of Co. Antrim based, Knights Wheelchair Basketball Club meets the world-famous Harlem Globetrotters. 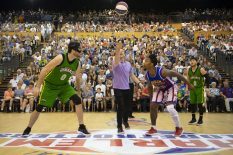 Jason met the globetrotters, his favourite team, as part of The National Lotterys Big Surprise which honours individuals who made a real difference with the help of National Lottery funding. Jason enjoyed a special meet and greet with the team who presented him with a signed ball and even asked him to do the honorary tip off at the beginning of the game. The Knights Wheelchair Basketball Club was awarded over £29,000 of National Lottery funding to help them provide opportunities for disabled people to get involved in team sport and continue to promote a healthy lifestyle for disabled people and encourage more social inclusion. 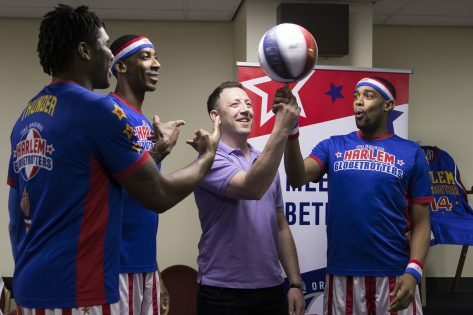 BIG SURPRISE: Jason Kennedy, Head Coach and Chairman of Co. Antrim based, Knights Wheelchair Basketball Club meets the world-famous Harlem Globetrotters. The National Lottery’s ‘Big Surprise’ – which honours individuals who have made a real difference with the help of National Lottery funding – will next weekend (14 July) make a dream come true for County Antrim man Jason Kennedy, Head Coach and Chairman of the Knights Wheelchair Basketball Club. SLAM DUNK: Jason Kennedy, Head Coach and Chairman of Co. Antrim based, Knights Wheelchair Basketball Club gives the honorary tip off at the beginning of a recent Harlem Globetrotters game. Jason met the globetrotters, his favourite team, as part of The National Lotterys Big Surprise which honours individuals who made a real difference with the help of National Lottery funding. Jason enjoyed a special meet and greet with the team who presented him with a signed ball and gave him the special honour of doing the tip off to start the game. The Knights Wheelchair Basketball Club was awarded over £29,000 of National Lottery funding to help them provide opportunities for disabled people to get involved in team sport and continue to promote a healthy lifestyle for disabled people and encourage more social inclusion. BIG SURPRISE: Head Coach Jason Kennedy (centre) and members of Co. Antrim based, Knights Wheelchair Basketball Club meet the world-famous Harlem Globetrotters. 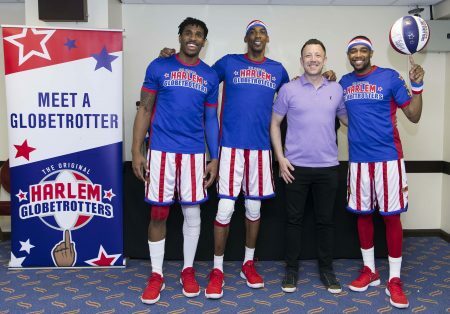 Jason met the globetrotters, his favourite team, as part of The National Lotterys Big Surprise which honours individuals who made a real difference with the help of National Lottery funding. Jason enjoyed a special meet and greet with the team who presented him with a signed ball and even asked him to do the honorary tip off at the beginning of the game. The Knights Wheelchair Basketball Club was awarded over £29,000 of National Lottery funding to help them provide opportunities for disabled people to get involved in team sport and continue to promote a healthy lifestyle for disabled people and encourage more social inclusion. 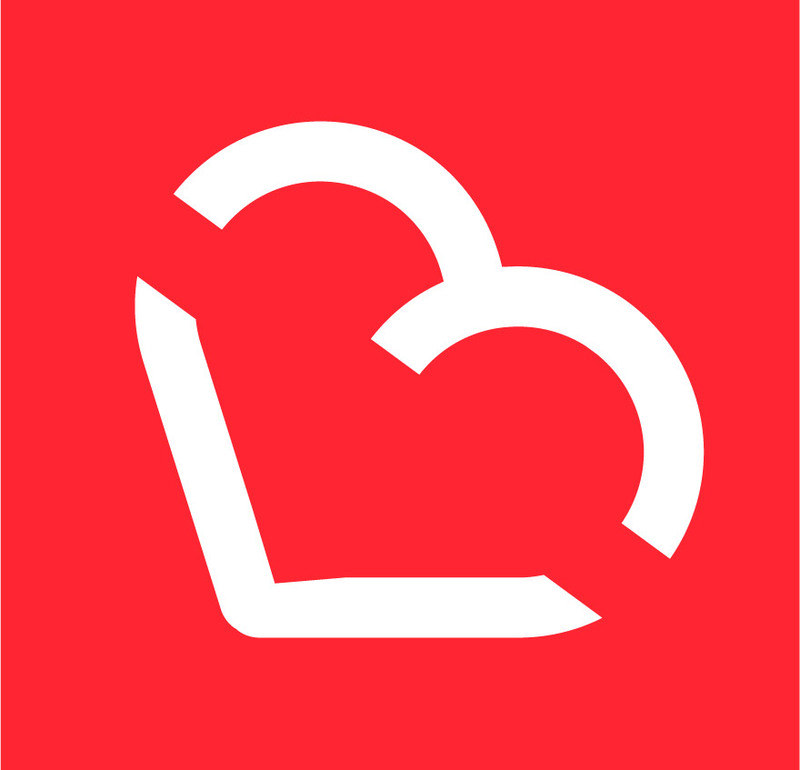 Jason’s ‘Big Surprise’ will air at 7.58pm during the ad break on UTV and is the third of 17 short films which will be shown throughout the year, during UTV/ITV’s primetime Saturday night TV schedule, that will celebrate and showcase National Lottery funded heroes across the UK. The all-important Saturday night Lotto results will also continue to be delivered during the weekly slot.